Quex Barn Photo Michael's Bookshop. Popular Quex Barn will reopen at the end of this month – 6 months after the business was devastated by a fire. The restaurant was left as a wooden shell after the blaze, thought to be started by an electrical fault, ripped through it last October. But owner Ian Mather has revealed that the barn will be fully reopened on April 29. The opening day will feature free tea and filter coffee all day. At midday the barn will be opened officially and at 7pm there will be a barn dance and hog roast, accompanied by music from The Contraband. For tickets call 01843 846103. The barn has a butchery, deli, wet fish stall, coffee shop and restaurant. 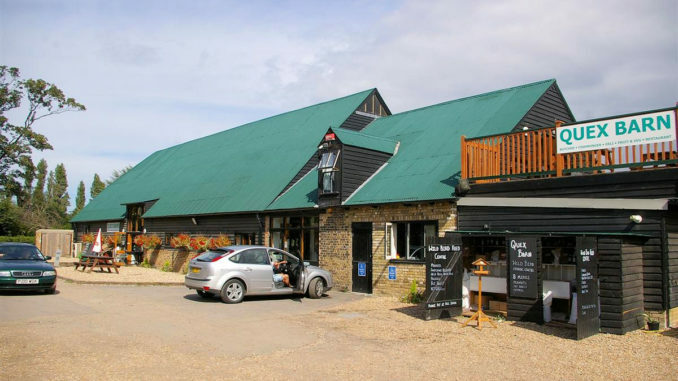 The business is known for its use of local produce Quex Barn is at the entrance of Quex Park Estate in Birchington.